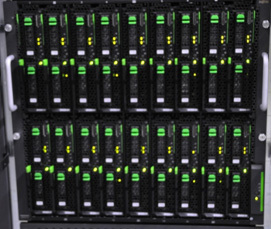 This laboratory is a powerful computer server cluster dedicated to experimental data analysis and simulation data generation for high-energy accelerator experiments. This system comprises 36 servers of Xeon X5570 (2.93 GHz) as a main CPU and Panasas Active Stor Series8 (40 TBytes) as a high-speed, large scale file server. 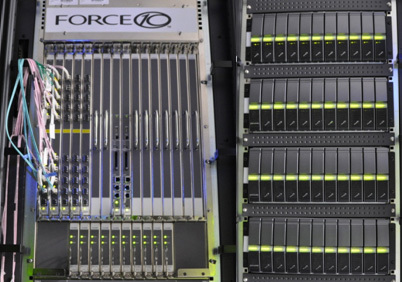 These devices are connected through a backbone network, Force 10 E1200i-AC, with a non-blocking data transfer of 10 Gbps and switching capacity of 3.5 Tbps. This system can analyze the entire tau physics data obtained form the B-factory experiment at KEK in about 6 hours and generate corresponding simulation data in a week. Figure 2. High-speed network switch, Force 10 E1200i-AC (left), and high-speed filing system, Panasas Active Stor Series8 (right).